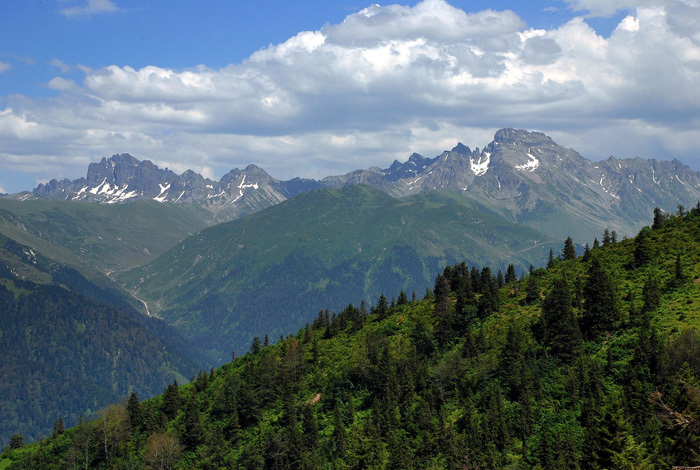 Kackar (Kaçkar) Mountains, which have an elevation of 3972 m, constitute the highest summit of the Black Sea. This is one of the focus points of the sport of mountaineering in Turkey. 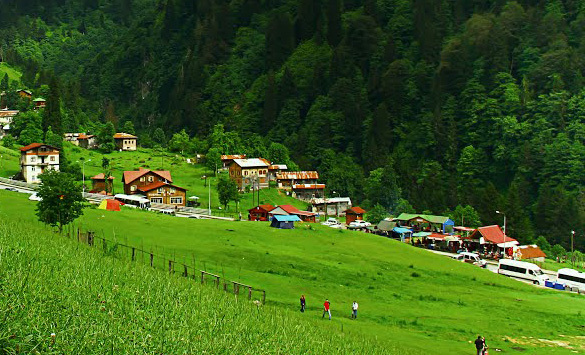 The mountaineering groups coming to the region are generally walking from the Yaylalar village of Yusufeli town in Artvin to the Ayder plateau of Camlihemsin town in Rize and complete their Trans – Kackar walk. The township whose territory is made up in the majority of mountainous and rough terrain, also possesses suitable areas for hunting tourism. Kackar Mountains National Park is in the most rainy forests of Turkey, therefore which has extremely rich alpine meadows and outstanding flora as well as unique in terms of streams. 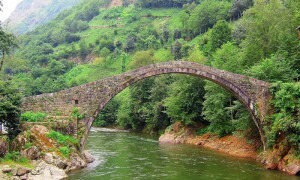 The areas around the Firtina River at the west of the mountains, and the Hemsin River on the east are covered with a rich range of flora. Firtina River and Hemsin River surrounds the national park. In accordance with the richness of flora, such as jackals, roe deer, wild boar, marten, hare, stoat, weasel, mammals, raptors, songbirds and wild rooster are available in the Kackar Mountains National Park. Kackar mountains offer some of the best hiking in Turkey, with magnificent scenery, challenging climbs and yayla communities. Nature photography, ecotourism for eco-travellers, geological and geomorphological formations, traditional highland life abundance of wildlife, natural plant communities, trekking, climbing, hiking, camping, heliskiing. Regional Office: 12th District (Rize), Provinces: Rize, Artvin, Towns: Camlihemsin, Yusufeli, Coverage Area: 52.970 Hectares, Coordinates: 40°51’40.15” N – 41°06’04.04” E, Height: 2800 m.
Turkey forms a natural bridge between the continents of Asia, Africa and Europe. In particular, the country occupies a unique geographical position at the crossroads between Central Asia and Middle East. The Kackar Mountain National Park includes the highest and longest Mountain chain of the East Black Sea Mountains with the Kackar (3,932 m) as the highest peak. 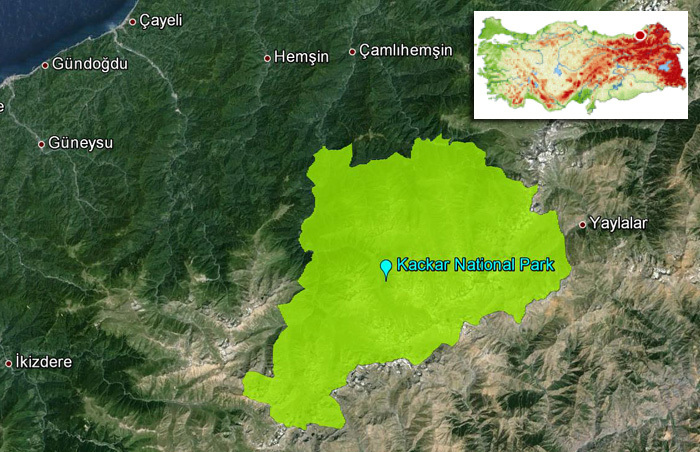 The mountain massif of the Kackar also represents one of the most highly glaciated areas of the Turkish mountains. Today, there are five large glaciers in the Park, which contributes to the biological diversity of the East Black Sea Mountains. There are 11 villages and 44 yaylas or summer pastures and seasonal herders living in the East Black Sea Region use the national park as a pastureland. 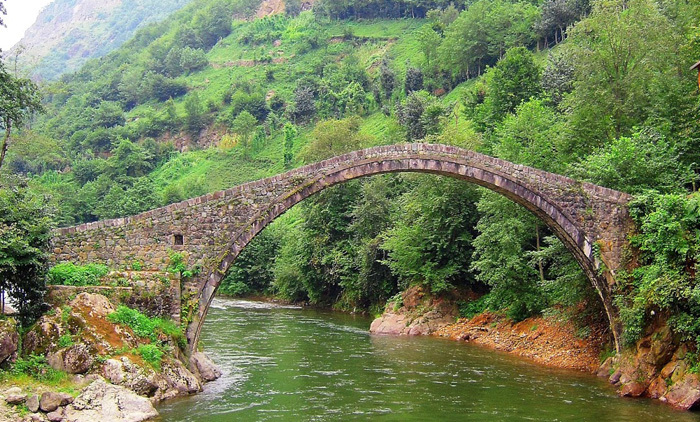 Kackar Mountains National Park is situated around 70 km east of Rize province in the Black Sea Region of Turkey, declared in 1994 as a national park, covers of 52.970 hectares. Ayder Plateau has the best facilities in the park, especially for those trekking for several days. Also there are specially designated camping areas in Camlihemsin. Trekking is increasingly popular in this area, and it is possible to hire a guide in Ayder and Camlihemsin. The most popular trekking season is summer, but these are the mistiest and most crowded months – popular wilderness campsites, particularly Dilberduzu in the heart of the range. 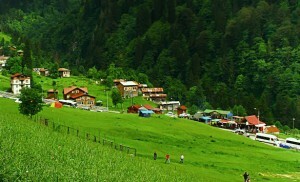 Kackar Mountains National Park, which is easily reached via Rize, Trabzon and Artvin.